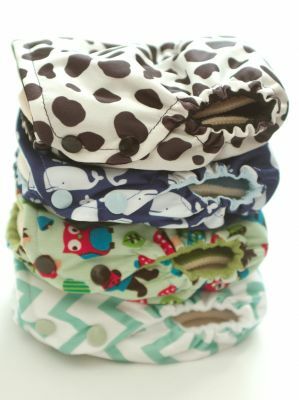 These side-snapping All-In-Two diapers offer the ultimate in trim fit and absorbent reliability. They are carefully constructed from polyester waterproof outers (PUL), soft-as-can-be microfleece, microchamois or athletic wicking jersey inners, gentle lastin elastic in the legs and back waist and KAM snaps. 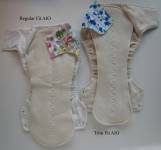 You choose your outer colour, inner fabric and snaps to create your perfect diaper! Each AI2 comes with one 6 layer 70% rayon from bamboo/30% organic cotton snap-in soaker topped with either wicking fabric to match the shell inner or bamboo baby terry.